I had no idea how much hormones could affect my every day life until last year when I had a miscarriage at 11 weeks. Not only was I an emotional mess, but I also felt like a stranger in my own body. I was having major skin issues, food sensitivities, brain fog, constant bloating, very little energy, and a serious case of post-partum depression. I knew that all of the hormone fluctuations were causing my body to go haywire. Hormones (chemical messengers that control most of our body’s major functions) can range from simple processes like digestion, to complex ones like mood and fatigue. Hormones play a huge role in the body’s health and well-being, and I was determined to figure out how to get my body back into balance again. If you’re a reader or follower of mine, then you already know that when my body is telling me something is wrong, I’m going to try healing it naturally by targeting the underlying issues through supplementation and nutrients. I began talking with other women who had suffered through miscarriage and researching how I was going to bounce back and heal my mind and body. One major thing I learned was that an unhealthy gut can contribute negatively to your hormonal and overall health. It made the most sense to start with my diet—by eliminating carbs and incorporating more hormone-balancing healthy fats such as avocados, nut butters, coconut oil, ghee, and chia seeds into my meals. Hormones are produced by certain fatty acids and if the body is missing them then it won’t have the necessary nutrients to make fatty acids and stabilize hormones. Antioxidant-rich fruits, vegetables and herbs were another go-to: cherries, berries, dark leafy greens, turmeric, basil, garlic, etc. I also started introducing healthy bacteria to my gut by taking probiotics, drinking kombucha and eating fermented foods. Aside from food, I discovered adaptogens and how they help the body adapt to mental and physical stressors. I ordered Ashwagandha and Cordycepts Sun Potions and some maca powder. I incorporated each of these adaptogens into my morning smoothies, along with an antioxidant-rich frozen fruit, chia seeds, collagen peptides and nut butters. Lastly, I needed to take care of myself with a whole lot more self-love and care. I went for an hour-long massage one afternoon at my favorite local spa. Afterwards, I spoke to an esthetician and inquired about OSEAMalibu skin care products that were on display. I was familiar with the brand, and read that their ingredients were organic and non-toxic. Many skin care products used today that aren’t natural or organic can affect us externally and internally. Our skin is our bodies’ largest organ, and it absorbs everything that we put on it. Luckily, I was introduced to OSEAMalibu, a female-founded family business, with products that are non-toxic, vegan, non-GMO and are made with natural and organic plant-based ingredients. Their products are free from synthetic ingredients, which can disrupt hormones. 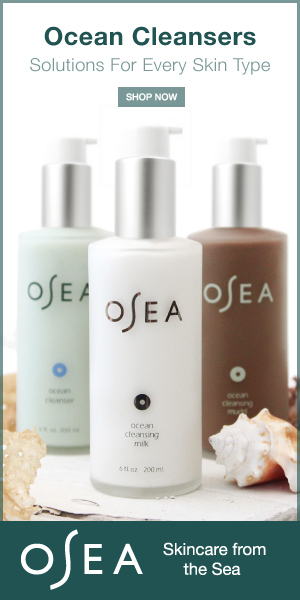 I began using the Ocean Cleanser, Red Algae Mask, and the Essential Corrective Complex oil, which contains essential oils that remove surface impurities. After a week of use, I noticed a huge transformation in my skin, and no longer felt ashamed to be in public. Self-care was something that I really had to put a lot of effort into in order to start healing internally. I started taking more baths and soaked in epsom salt, magnesium and lavender essential oil. I would read about other women’s experiences, and this taught me how to cope with such a difficult loss. I went to yoga and SoulCycle weekly, where I could spend time meditating and healing.